The flower viewing season has arrived a bit early this year as the cherry blossom trees all around has started to bloom and its petals scattering all over the ground. I noticed this when I headed to work at the hospital. On the Sunday of the week before the new school year starts, my parents, grandparents, and extended family organized a picnic at the park. I don't really know anyone besides my immediate family, Kenji (uncle) and Aiko (cousin), so it feels like I'm surrounded by strangers even though they are blood-related to me. So this event is actually quite big. I think some of them brought their friends along, but I can't tell them apart from the relatives whom I don't know. The first thing I did after waking up is to head straight to the bathroom to freshen up and to take a bath. I had to use it before my three younger siblings as my school is further away than theirs, and, with their age, they would need more sleep anyway. Father is nowhere to be seen and mother is preparing breakfast for the rest of us. Right after taking a bath, I headed back to my room to change. By this time, my brothers had just woken up and greeted me as I walk past them. I put on my uniform and am already feeling warm and comfortable wearing it, though this warmness I feel right after putting it on could be because my mother had just ironed it just a while ago. My primary and middle school uniforms did not have a ribbon like this, which either had a scarf-like ribbon for the sailor uniform or none. At work, it would be any kind of clothing and a (large) white lab coat on top. So it looks like I need to get used to it, but since I had worn many different kinds of clothing, it shouldn't be that hard. After wearing the knee-length socks, I looked at myself at the mirror. Is that really me? It makes me look good and looked as though I had grown up. My dad was right, I do look somewhat like him. I headed down to the kitchen for breakfast. Mother had prepared scrambled eggs and pancakes, along with drinks and my lunch box. She is now busy preparing the same for my younger siblings, but she did talk to me on things like how high school was for her, and that she would be taking a photo of me on my way out. Mother kept looking at the clock as I was reading the newspaper. As I was looking the TV schedule section, she said that it's almost time for me to go and says to take a photo now. I made to just outside of the front gate of the house. My mother brought along a camera to take a photo of me in my new school uniform. Is this necessary? All of my siblings, except my youngest sister (4 years old), who is running around, were following behind mom and commented on how grown up I had suddenly become. Well, they are still in primary school and one in kindergarten, which explains why I am larger than them. Not so when my youngest sister is in her mid-teens, by which, I could probably be getting ready to be married. My brothers were half-dressed, as though they rushed here while changing as soon mom mentioned that I was leaving, and my oldest younger sister is still in her pyjamas. To tell you the truth, I rarely hear the names of my own family members as we always call each other in such a way without the name being used. Not sure about them though, except, obviously, my parents. After spending some time taking pictures of me in various poses, the time to leave has arrived. Everyone wished me good luck and to have a safe trip. This family is too big for this house. Too bad I am a part of it. What were my parents thinking? I was born several years earlier than everyone else, and have many siblings. Because I have that many siblings, my dad is having trouble on keeping up with the family finance. It's a good thing my uncle, who is a director of a large company I work for, is kind enough to help us. I met up with my cousin along the way to the bus stop. Wow, hers looks great too. Well, there are obvious differences between mine and hers in terms of design, but in terms of which is better, it's hard to tell, but we have seen the worse ones before. 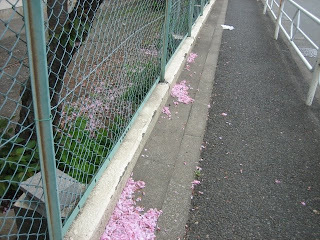 Everywhere we go is filled with cherry blossom petals on the trees and the ground. The bus soon arrived. As we boarded at the middle of the bus, we saw that the bus was full of students of various schools and some salaryman. I spotted newbies like us on the bus judging by how nervous they are and how "bright" their uniforms are compared to another of the same school. Also, why do I have an image of salaryman being always in office attire without fail, their bosses treating them like dogs, work there until late at night, and then party hard late at night with their colleagues until they are drunk? Some stops later, we alighted at the train station, proceeded to the train platform, and then board the train that heads to near our schools. It took us quite a while to do each as there is a large crowd, but it's relatively straightforward route from here until the station we are heading to.